The Humans are one of the seven playable races in Starbound, and one of the six races entrusted with an Ancient artifact. Humans hail from the planet Earth, and greatly resemble the Apex, only with much smaller brow-ridges and much less body hair; it is said that the Apex were likely much more Human-like before the VEP "inoculation" altered their physiology. Humans are generally an inventive, optimistic species with a drive to explore and learn, and are considered mostly harmless. Not much is known about Human history before their discovery of warp drive, though what is known is that it involved a series of wars and conflict over finite resources. The ability to travel quickly between the stars soon led to a peaceful post-scarcity society, using advanced technology in the goal of exploration and advancement of learning. Despite their voyages across the stars, large-scale colonization was actually uncommon, as many Humans either chose to return to Earth or live a more nomadic existence. Though settlements are rare, Humans are a common sight in scientific outposts and spacelanes throughout the universe, including many installations run by the Hylotl-owned Letheia Corporation. During this time two major groups came to prominence: the altruistic Terrene Protectorate, which sought to assist and welcome beings of any race for the betterment of all life in the universe, and the profit-seeking and less-morally-upright Universal Space Corporate Military. The latter eventually collapsed after a long string of bad luck followed by a catastrophic bioweapon failure, with most of its members taking up interstellar banditry. Humanity would suffer a crippling blow with the destruction of Earth, as it was torn apart by The Ruin. Billions of lives were lost, as well as most of the Protectorate's membership which had gathered at the main headquarters. This catastrophe also saw the rise of the Occasus Cult, a hidden organization of ultra-xenophobic Humans who sought to wipe all other races from existence through the Ruin's power. Despite this, Humanity continues to survive, and perhaps one day may again thrive. As with the other player races, Human characters are given a set of uniquely-styled Armors, their own Ship type (with included Pet), and two unique Mech bodies. The Human equipment are generally high-tech semi-militaristic in aesthetic. Their stats are the same for all other race's equipment at the same Tier. A Human player has four sets of race-specific Starter Clothing to choose from in the Character Creator, plus the standard-issue Protectorate T-Shirt and Protectorate Vest. These items have no defensive capabilities whatsoever. These four sets are also used to clothe randomly-generated Human NPC villagers. The overwhelming majority of Cosmetic Armors in the game in random chests across the universe can be considered "Human"-themed. To save space, we are only going to list the items directly Human-tied, particularly those found in Human Dungeons. Like the Starter Clothing, these have no defensive capabilities, but let the player customize their character's appearance. The Human Ship is a somewhat blocky spaceship. Its size can be expanded by obtaining more Crew members, which allows the player to buy a higher-class Ship Licence from Penguin Pete for every two more Crew members. Alternately, the player can buy counterfeit licenses from Penguin Bay: these licenses are expensive, but do not have crew requirements attached to them. Once upgraded to the Condor Class (the largest Ship class), the Human ship takes on a decidedly "hammerheaded" look, with most of its bulk pushed to the back half, and a control room at the front of a long hall. Human ship pets are Cats, coming in one of ten different colors and patterns chosen at random. Human player-characters have the ability to craft two unique Mech body types. The Venturer-00 Mech Body is the first Mech body the player will obtain, by completing Dr. Akaggy's "Test Drive" quest at the Outpost and unlocking the ability to use Mechs. Its advanced version, the Venturer Mech Body, is obtained by completing Akaggy's later "Advanced Test Drive" quest. Human NPCs are incredibly common despite a relative lack of villages and dungeons. Lone Human Merchants can pop up on nearly any world (both through normal planetary generation and temporarily as part of a Quest), and spaceships and space stations may have Human crew. 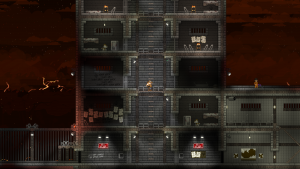 Humans are also common in multi-race microdungeons, such as Savannah houses and scientific outposts in Mutated and Tundra Biomes. On top of all that, the Occasus Cult and ex-USCM bandits are common foes on random planets and spaceships. Human campsites and prisons can be found on all planet types that can have surface-level full-sized dungeons except for Lush (aka "starter") planets. Unlike other races' dungeons, there are no specific planet types they're more likely to occur on. A variety of Human Tenants can be summoned by placing a Colony Deed in a suitably-furnished room. These Tenants will always be Human regardless of whatever racial furniture is placed in the room, with a few exceptions. The Hazmat Scientist, Hunter-Gatherer and Neon Tenants have a 50/50 chance of being Human or Apex, while the Scientist has a 1 in 3 chance of being Human, Apex or Hylotl. Humans feature in a good number of Codex books, both written by Humans and by other races. The Humans underwent easily the largest number of changes during Beta development, both in terms of backstory and in direct gameplay elements. The human unique pet may be a reference to the movie Alien, in which the characters had a pet cat on their spaceship. The human starting ship may be a reference to the hammerhead corvettes from the Star Wars franchise, as it has the same distinct vertical hammerhead and overall appearance from the side. The human respawn animation is a reference to body reconstruction scene in the 1997 movie The Fifth Element.